In Jesus Feminist, Sarah Bessey speaks with courage and conviction on a topic near and dear to my heart. 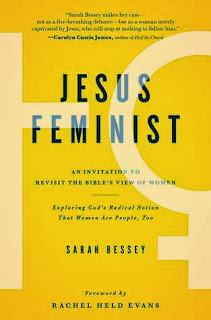 Many Christians, and many conservatives, have a knee-jerk revulsion when they hear the dreaded "f-word" feminist, but early on in her book, Bessey declares, "Most of what has passed for a description of feminism is fearmongering misinformation" (something which can also be said, ironically, of Mormonism). She continues to clarify: "It's not necessary to subscribe to all the diverse--and contrary--opinions within feminism to call oneself a feminist." Like, Bessey, I identify as a feminist "precisely because of my life-long commitment to Jesus and his Way." As Rachel Held Evans does in her book A Year of Biblical Womanhood, Ms. Bessey points out that the cultural and societal environment the various writers of the Bible were surrounded by inevitably influenced their writings. For example, there is not a single verse in the Bible that explicitly denounces slavery. Slavery was simply a given during biblical times. However, many of those who wrote about slavery, including Paul, introduced a radically different approach to the institution, encouraging slave-owners to treat slaves fairly and kindly and welcome runaway slaves back without punishment. Of course, that doesn't mean that God approves of slavery, a thought which the vast majority of Christians (and people of all faiths) today would find abhorrent, but that the prophets and apostles worked within the imperfect social structures that were present at their time. A similar process is at work today whenever we read and interpret Scripture, as we are all to some extent products of our time and culture: "Whether we admit it or not, as people of faith, we sift our theology through Scripture, Church history and tradition, our reason, and our own experience." Bessey describes her growing frustration with what she perceived as a distance between what she believed the gospel demanded of her and what "the churches of my context and tradition" were preaching and focusing. Much of what she writes describes my own struggles over the past several years. "I struggled with the cultural rhetoric against immigrants, homosexuals, artists, welfare recipients, the poor, non-Americans, and anyone who looked different or lived differently than the expectation. Cultural mores were passing as biblical mandates. The give-me-more-more-more prosperity gospel didn't match up with my growing commitment to contentment and simple living...For the first time in my life, I was reading and learning about the church's mandate to care for the poor. I was reading voraciously about global issues such as clean water, community development, war, human trafficking, economics, disaster relief, and AIDS crisis, unjust systemic evils." To make matters worse for Bessey, she says, "When I turned to the Church for answers, I did not feel my questions were welcome. This may have been my own pride and willful blindness, but there didn't seem to be room for me as a questioning woman within the system." Stuffing all of her questions and cognitive dissonance in the closet simply didn't work and eventually, the "crammed closet of doubts and questions and hurts" burst open and everything fell apart. So Bessey stepped back "into the wilderness" for a while. She distanced herself from the "easy consumer spirituality", and spent time with God, reconciling what she believed and why. "I loosened my grip on my opinions. I entered recovery for being such a know-it-all. I stopped expecting everyone to experience God or church or life like I thought it should be done...I learned the difference between critical thinking and being just plain critical." She developed a personal relationship and "intimacy with God" that freed her from "crippling approval addition, from my Evangelical Hero Complex, from the fear of man." And she learned to "Stay there in the questions, in the doubts, in the wonderings and loneliness, the tension of living in the Now and the Not Yet of the Kingdom of God, your wounds and hurts and aches, until you are satisfied that Abba is there too. You will not find your answers by ignoring the cry of your heart or by living a life of intellectual and spiritual dishonesty." Bessey also provides a new perspective on the biblical word ezer, one that stirs my soul. "God called the first woman ezer --a name he embraces for himself throughout the Old Testament...he named his daughter after himself." "In the Old Testament, the word ezer appears twenty-one times in three different contexts: the creation of woman, when Israel applied for military aid, and in reference to God as Israel's helper for military purposes. God isn't a helpmeet in the watered-down milquetoast way we've taught or understood that word within our churches, is he? No, our God is more than that: he's a strong helper, a warrior. "By naming his daughters after this aspect of his character, God did not name women as secondary helpmeet assistants. No, friend--women were created and called out as warriors." Again and again Bessey comes back to centering one's life on Christ. Without a relationship with him, without him directing our efforts, we will not be successful. "As feminists, we've sometimes found that our self-efforts are misguided and often frustrating. We see injustice and want to overturn it--now. I get this, and I feel it, too. We absolutely need to engage in the daily, impossible, frustrating, swimming-upstream work of overturning injustice. "But we must remember that all of those efforts are ultimately frustrating, sometimes even misguided, without Christ. If Christ is not at the center of the work, if he is not the author of the work, the glory of the work, then it is often unfruitful and incomplete." Bessey closes with a beautiful prayer or "commission" for her readers, sending them out into the world to do good, be lights, and serve God. Here are just a few of the phrases that touched me. "I pray that you would be given the gift of realizing that you were wrong about some important things." "Choose freedom. Choose the freedom of living loved, far from their debates and fence lines and name callings, and the belittling, divisive stereotypes. Extend the gift of freedom and grace, second chances, and more grace, just as you have received them." "The Kingdom of God will be better with your voice, your hands, your experiences, your stories, your truth. You can go where I cannot go, and someone needs to hear you sing your song. You are someone's invitation." "May you make room in your life to be inconvenienced and put out, and may you be Jesus with skin on for a few people." "I pray that no matter your tool or method (mothering, preaching, cooking, writing, organizing, washing, teaching, building, money making--all of your whole life encompassing it all) you will walk in the knowledge of the sacredness and purpose of your calling." "I pray that when you are bored and tired and discouraged and frustrated, when you feel futile and small and ridiculous, you will never, never give up." "Keep your eyes open for the signs of God's presence; he's already at work in your world, revealing his ways to us all." "We're in this together; let's do it together." Finally, this reminder soothes my soul and provides comfort and encouragement: "There is not one way to be a woman; there is not one way to do women's ministry. There is only loving and serving God, doing life together in the full expression of our unique selves. Make room for them all and give glory to God."